In order to explore ever-more exotic regions of the nuclear chart, towards the limits of stability of nuclei, European nuclear physicists have built several large-scale facilities in various countries of the European Union. Today they are collaborating in planning a new radioactive ion beam (RIB) facility which will permit them to investigate hitherto unreachable parts of the nuclear chart. This European ISOL (isotope-separation-on-line) facility is called EURISOL. The European Expert Committee NuPECC has recommended the construction of EURISOL as one of two “next-generation” RIB infrastructures in the EU. The other project, FAIR (GSI, Germany), will use the fragmentation technique. 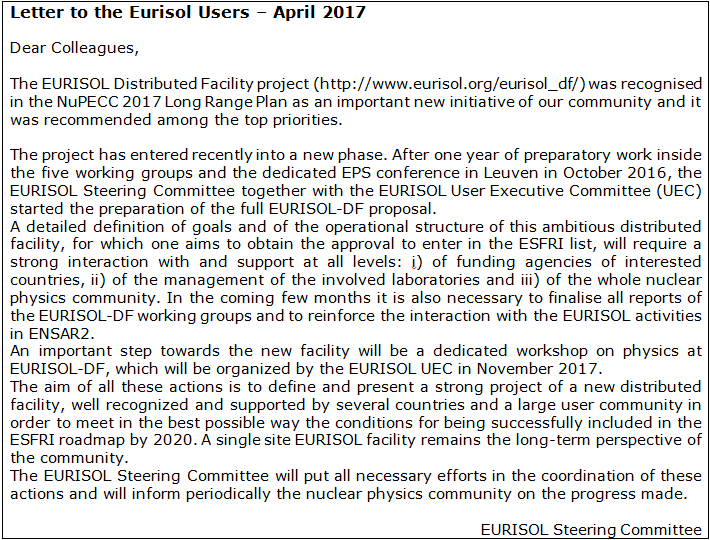 The EURISOL project is aimed at the design – and subsequent construction – of the “next-generation” European ISOL radioactive ion beam (RIB) facility. The ion yields delivered by the current ISOL facilities, or those under construction (HIE-ISOLDE, SPES, SPIRAL2) will be exceeded by at least a factor 100. This will open a wide field of research for physicists. A first Design Study began in 2005 in order to work on the technologically challenging aspects of the project, the instrumentation and the radiation safety issue. It was continued with the EURISOL Design Study, which was finalized in 2009. As defined in the Design Study, the EURISOL layout consists of a superconducting linear accelerator providing protons of energy 1 GeV and an impressive power of 5 MW, but also capable of accelerating deuterons, 3He and ions up to mass 40. The beams will impinge simultaneously on two types of targets, either directly or after conversion of the protons into neutrons through a spallation target surrounded by kilograms of fissile material. The unstable nuclei produced diffuse out of the target, are ionized and selected, and can be used directly at low energy or reaccelerated by another linear accelerator to energies up to 150 MeV per nucleon in order to induce nuclear reactions. The existing and under construction European ISOL facilities, in particular ISOLDE, SPIRAL 2 and SPES, with future ISOL@MYRRHA, can be considered, as intermediate and ambitious step towards EURISOL, working together to realise the project EURISOL – Distributed Facility (EURISOL-DF). The EURISOL-DF project preparation is coordinated by the EURISOL Steering Committee.